The so-called ‘Enochian’ or ‘Angelic’ system of magic outlined in the diaries and papers of the Elizabethan genius Dr John Dee has enthralled, fascinated and befuddled occultists since the Hermetic Order of the Golden Dawn incorporated it into their eclectic blend of ritual magic in the closing years of the Nineteenth Century. Of course, the Enochian magic of the Golden Dawn was very, very different from the Enochian magic of John Dee and his roguish skryer Edward Kelly. MacGregor Mathers, who developed most of the Order’s rituals and knowledge papers, tried to integrate it with the rest of the Order’s conglomeration of magical rituals, introducing elements of Qabalah, astrology and Tarot symbolism with the Enochian source material. Some of the Enochian papers – such as the Heptarchia Mystica – were simple ignored altogether by the Golden Dawn. Some of the Enochian words and names were used in the grade rituals of the outer Order, but the full corpus of the Enochian system was reserved for the inner Order, the Roseae Rubae et Aureae Crucis. To quote Israel Regardie, who chronicled the Order’s rituals and publications in his massive tomes, the Enochian system was considered to be quite literally Angelic in origin, and was viewed as “the jewel in the Golden Dawn’s crown”. Most occultists since that time have tended to follow the Golden Dawn’s approach to Enochian, primarily because that was the system which was available to them, published first in Aleister Crowley’s Equinox and later in Regardie’s volumes. Therefore, Enochian has accrued to itself the reputation of a very secret and sacred and powerful system of magic, something which is very volatile and dangerous to use and which at all costs must be approached by proven Adepts only. This attitude is rooted in the Golden Dawn’s reservation of the material to its inner Order and the insistence upon the Divine providence of the system. But Enochian magic has not stood still, it has grown and changed and undergone various metamorphoses over the years. Crowley published his utterly sublime The Vision and the Voice, recounting his experiences in the Æthyrs, which changed the philosophical underpinning of Enochian forever, introducing several models and new currents which still ride the crest of modern magic. The Schuelers took the basics of the Golden Dawn model of Enochian and reworked it into an entire magical system in its own right. The philosophical and practical bases of Enochian magic have been advanced and transformed in the crucibles of the Church of Satan and the Temple of Set. Enochian has played a large role in my own magical history as well. Not only because it’s a fascinating system, but also because of my fascination with Dee as a person. As such, it has necessarily been one of the things that has contributed to the developing philosophy and practice of The Apophis Club. This book therefore seeks to provide a text book suitable for the Club and other interested Initiates, adapting our curriculum of Work to an Enochian flavour. The first section will contain the basics of the five main components of Enochian magic: the tools of the Art; the Heptarchia Mystica; the four Watchtowers; the Angelic Calls and the Enochian language; the thirty Æthyrs. These will be presented in summary form for easy reference, without any philosophical or practical instruction at this point. The second section will discuss John Dee and Edward Kelly and the origin of Enochian. The third section will examine in turn the various claims that others have made about Enochian and the ways it has been adapted by many hands. Some of these adaptations will be adopted, some will be rejected, and others will be at the reader’s discretion. The fourth and largest section will be the grimoire section of the book. Here, the various parts of Enochian magic will be woven into a coherent, whole system, organised according to the Seven Heads of Vovina, the Stooping Dragon, who will arise in power in the consciousness of the Initiate through this Work. Be warned: this section contains real, transformative practices which are not for dilettantes and may turn your life on its head! The fifth section is an appendix which explores some controversial additional material which people of a certain disposition may like to explore more thoroughly, but which is incidental to the main curriculum. There is tremendous power to be found in this book and the Work it contains and it is my ardent hope that it will be as useful and transformative to others as it has been to me. I make no apologies for sacred cows slaughtered along the way, nor for necessary innovations. This is a book for progressive magicians, not Elizabethan purists. 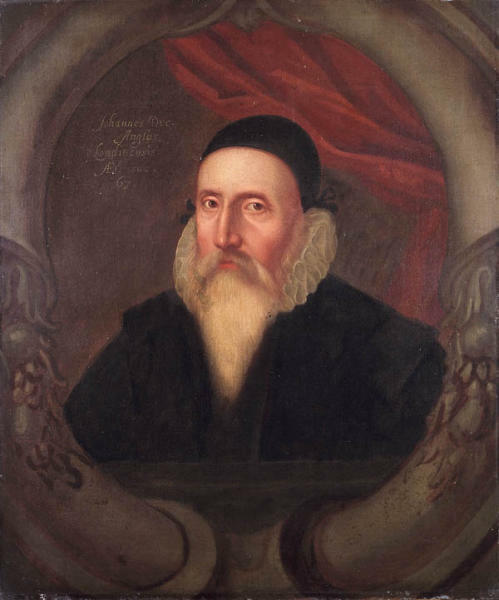 And I really do believe – for reasons that will become apparent – that John Dee would approve of the progress that has been made and that time has not stood still. The book can be ordered in printed form from Amazon in the US or the UK, or as an ebook for Kindle in the US or the UK. The Kindle version can be read free of charge if you are a Kindle Unlimited subscriber! Posted on September 6, 2015 September 6, 2015 by manxbull	This entry was posted in Draconian, Magic, writing and tagged Apophis Club, Draconian Magic, Edward Kelly, Enochian, John Dee. Bookmark the permalink.